All homes have a certain style whether it be contemporary, rustic, traditional or a mix. A homeowner should always decorate a home on the inside and outside in a way that will make them feel proud to pull up to the driveway. One recent trend is the transitional design movement. Whether you are eighty-five or twenty-five years old, your home can become an oasis of beauty and elegance with the right touches. If you’re unsure what transitional design is or how to incorporate it into your home, read on for some easy tips that will turn your home into a mixture of grace and glamour. The age of the millennials have descended upon us, and with them also comes the concept of new technology and ideas regarding interior design. You may think that with new and innovative ideas evolving, some traditional concepts may have dwindled, but certainly not all. That’s what transitional design is all about. It’s a desire to mix together certain traditional interior design concepts with those that are newer. It’s a coming together of rustic and traditional styles with modern looks and feels. Below are a few common characteristics of the transitional style that are not necessarily found in all transitional homes, but tend to be popular. One of the most interesting aspects of a transitional home is that you have the flexibility to choose what you want to incorporate so that your home matches your style. When two different styles are paired, there can be a feeling of chaos or clutter. However, transitional homes are different in that they have a preference for a clean feel. Walls are not overly cluttered with trinkets and paintings. Instead, the heart of the decoration is in the meshing of the fabrics and styles. For this reason, avoid using too many accessories. If you do use them, make sure to offset them in a stylish way. For example, if furniture is following a pattern of bold graphic design or has a textured feel to it, you can decorate a mantle or the walls in a simple, yet elegant way. Traditional styles for furniture tend to include curvier lines, such as on the backing of dining room chairs and along the lines of a table. Modern styles include smoother, straighter lines. A transitional look may opt for straight, sleek lines of furniture and walls instead of going for that modern curvy look. A clean look is so important to nailing the transitional feel. You don’t want crazy curves and shapes and go overboard on the room. Since the meshing of the styles is already making a strong statement, straight, clean lines help to keep the minimalist vibe and avoid an overly disorganized look. Another option when it comes to lines is rounded curves, such as circular or round artwork like a painting. Another idea is to put a clean, fresh potted plant in front of a window in a room with elegant looking traditional sofas to offset the traditional style with a modern feel. While modern interior design looks may prefer a lighter, crisp feel with whites, grays and earth tones, traditional looks have a preference for darker reds and browns, giving a bold statement. A transitional design will combine those two statements and perhaps opt for clean white neutral colors paired with a dark hardwood floor. Usually the most common types of colors you’d find include a light tan or off-whites that you can mix in with darker browns if you want to add some depth and dimension to the room. In a home that follows a transitional design, you may find a mantle that is decorated with simple pieces of silver, such as a few candlesticks. Fabrics can then be brighter and more patterned, following a traditional look. According to HGTV, fabrics that tend to be very popular include light colored and earth-toned suedes, as well as leathers and chenilles since they give off a rich, warm feeling. These types of strong fabrics can be paired with lighter tones to provide that transitional counterbalance. Depending on the room, the transitional home design can vary. For example, in a bathroom, you may find wooden cabinets and drawers that give off a rustic, traditional feel paired with cleaner tiles such as smooth off-white ceramic and glass doors. Rather than heavy lamps, custom lighting can help to keep the room light and uncluttered. A kitchen may pair that same wood look with other materials for a transitional room. For example, a dark wooden floor that is typical of traditional styles can give a cozy feel to the kitchen space, while an all white or vanilla colored cabinet, table tops, and back-splash provide that modern sleek feel. For a more modern floor, a light colored floor can be matched with darker wooden drawers and cabinets that will beautifully offset white counter-tops and modern lighting. The darkness of the cabinets does not weigh the kitchen down but instead provides a feel of rich contrast with the whiteness of the walls and counters. Can the Exterior be Transitional? You can have a transitional design on the outside of your home as well as the inside. For example, modern exterior looks often opt for a ton of windows so that natural light can come in and provide that clean feel to the house. With a beautiful ornate chandelier that shines through windows, you can combine a traditional lighting feature with large windows. The clean lines and shallow grooves of typical modern homes can be transformed into transitional masterpieces by the use of stone, brick, and wood. Even steep grooves with several floors that are typical of colonial homes can be paired with tons of windows to give more of a transitional look. No matter what type of home you want to create, if you add elements that appeal to you, you’ll feel content and cozy in the confines of your home. By going for a transitional home design, you can achieve both a traditional and modern look that combines the best of both worlds. Sleek, clean lines, neutral colors and a minimalist feel paired with the rich and warm elegance of traditional styles make a transitional home an inviting place to be. If you’re thinking about a transitional home design style, these tips will help you get started in regards to the interior of your home. 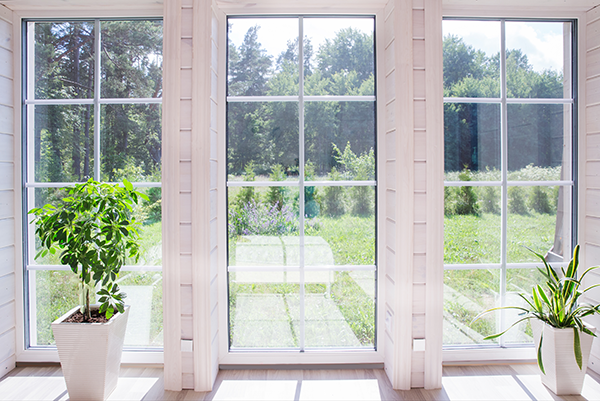 Your windows, siding, and doors play a huge role in transforming your home’s look as well. Feldco is the leading window and door company in the Midwest with over 350,000 delighted customers. Talk to a product specialist about your transitional home design project and get a free quote today.